Nelson Mandela was sentenced to life in prison by a South African court on June 12, 1964, after being found guilty of sabotage and conspiracy to violently overthrow the apartheid government. While Mandela’s imprisonment was criticized in the U.S. and abroad, at the time of his arrest, U.S. policy towards South Africa was more concerned with preserving access to South Africa’s natural resources than directly confronting apartheid. The five documents included in today’s posting, all part of the Digital National Security Archive’s South Africa collection, provide a glimpse of the U.S. walking a tightrope between strategic concerns and human rights issues at the time of Mandela’s arrest, and contextualize the outpouring of response to Mandela’s recent passing. The first two documents originate from the U.S. Embassy in South Africa and outline the U.S.’ Internal Defense Plan there. A Top Secret December 18, 1962, Airgram from U.S. Ambassador to South Africa, Joseph C. Satterthwaite, to the main Department of State office in Washington, states that the U.S.’ policy towards South Africa does not support the repression of the legitimate claims of black South Africans, but that the U.S. should only support military intervention in South Africa if subversive activities can be attributed to communists, or if U.S. national security is directly threatened. The Secret December 18, 1962, Internal Defense Plan enclosed in the Airgram notes that despite apartheid’s “liability,” the South African government is an important asset thanks to its opposition to Communism, its strategic shipping lanes, and its willingness to accept U.S.-operated tracking stations in its territory. The Plan states that the U.S.’ criticism of apartheid is because the racist policy spreads Communism, undermining U.S. influence in the region, and recommends that Louis Armstrong and Harry Belafonte visit to promote goodwill. Another interesting glimpse at the development of apartheid-era policy is a series of July 1963 memos between the top brass at the Department of State. The first is a Secret June 12, 1963, memo from Gov. 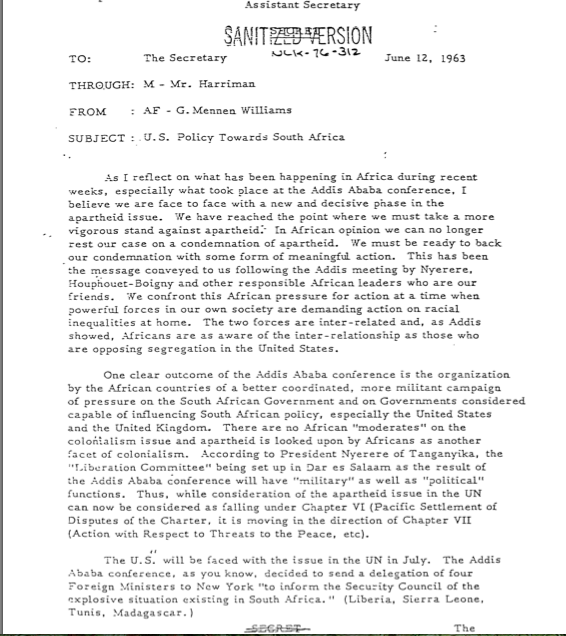 Mennen Williams, then serving as Assistant Secretary of State for African Affairs, to Secretary of State Dean Rusk, which reports that apartheid had reached a “new and decisive phase” after the Summit Conference of Independent African States in Ethiopia in May 1963. Mennen states that U.S. condemnation of apartheid must include “some form of meaningful action,” that racial discrimination in the U.S. and in South Africa are regarded as interrelated issues, and recommends that the U.S. impose total Arms embargoes against South Africa to prove the Kennedy Administration seriously opposes South African policy. The Secret June 12, 1963, memo from Gov. Mennen Williams to Secretary Rusk. U. Alexis Johnson, Deputy Under Secretary for Political Affairs, expresses a different view than Williams in a Secret June 14, 1963, memorandum to Rusk. Johnson, while believing apartheid will eventually prove “disastrous,” advises against imposing a total arms embargo on South Africa because its cooperation with the U.S. on aircraft landing rights, tracking stations, and ports, will be increasingly important if the U.S. can’t maintain access to the Suez Canal. Johnson also argues that discontinuing arms sales to South Africa would only have a limited effect unless countries like Sweden and Switzerland followed suit, and would limit U.S. policy flexibility. While these documents add interesting context to the U.S. response to Mandela’s passing, they provide just a glimpse of the multifaceted nature of U.S.-South Africa policy. For a more complete view or the U.S. apartheid-era policy, please visit the Digital National Security Archive’s South Africa collection.